Courage after the Battle covers the unseen areas, from leaving the battlefield to leaving the armed forces, how these areas struggled for acknowledgement in the early years before WW1 and how they are still struggling today: the slippery slope to Drugs, Alcohol abuse, Homelessness, PTSD as well as other mental and physical injuries affecting the family unit. Courage after the Battle contains details of charities and organisations that can give much-needed help as well as details of the pain, frustration and suffering that service personnel go through every day. Eighty-five per cent of veterans think that, after serving their country, there is inadequate support; some feel completely forgotten, lost in the system that is Civvy Street. Courage After The Battle provides details of help that is available, post injury and trauma, despite dogged pride and suffering in silence. It also shows how the family and spouse suffer alongside their loved ones and occasionally receive the brunt of frustration with the system. A far cry from the public's perception, it shows what can be the reality for service personnel that the public never see. Start reading Courage After The Battle on your Kindle in under a minute. 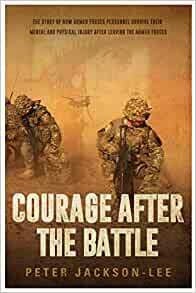 Courage After The Battle written by ex-Royal Marine and Falklands veteran Peter Jackson-Lee, is a book that takes the reader on a journey that most people will never experience. The book is a travelogue that explains how service men and women navigate their way from battlefield injury back to civilian life. The book also examines the history of battlefield medicine, mental healthcare, prosthetics, reconstructive surgery, politics and changes in social welfare. At turns, the books is inspiring, fascinating and deeply troubling. The book is written in a balanced, no-nonsense, straightforward style and tone. Peter Jackson-Lee lets the veterans, families, healthcare professionals, charity workers and facts speak for themselves. He explains the history of every technical, medical and procedural advance that makes suffering a battlefield injury move survivable. However, while overall survivability of battlefield injuries has steadily increased, the opposite is true of long term care. Consecutive governments have overseen punitive cuts in the provision of everything from mental healthcare to housing, and much more besides. The final third of Peter Jackson-Lee’s book explains the covenant between the Armed Services, the Nation and UK Government. The book also lists around 150 national charities and other organisations that provide help and support to current service personnel, veterans and their families. The fact that over 70 pages of the book simply list charitable organisations that offer support is alarming. It demonstrates the betrayal of the Armed Forces Covenant, and the abject failure of government policies stretching back decades. In many ways, this book is the story of a shocking, perennial national disgrace. My mum abdoutely loved this page turner of a book. She loved the style of writing, the way the story was told and she loved every word. She says it was a eye opener of the issues discussed in the book.